An UpBeats workshop is perfect for Arts Week, one-off assemblies, cross-curricular projects and also to encourage pupils to take up a musical instrument. The UpBeats are able to integrate with Whole Class Ensemble Teaching (WCET) and instrumental lessons in school. Lift Off – Journey to a galaxy far, far away and explore the sounds of space. We can also design bespoke workshops for your group (please email to discuss your requirements). Workshops are 2 hours, delivered on a Wednesday morning for up to 80 pupils. They are suitable for Key Stage 1 or Key Stage 2, including SEN/D groups. “Thank you so much to you all for today, it was a wonderful experience for our pupils.” – Teacher at Hillside Specialist School. “It was fantastic for the children to hear live music and learn about the families of the orchestra. 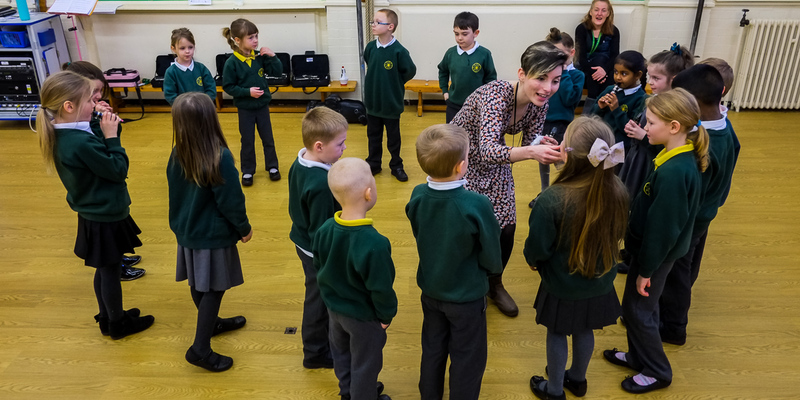 The UpBeats showed real enthusiasm and motivated all of our children to create an exciting composition.” – Headteacher at Farington Primary School.